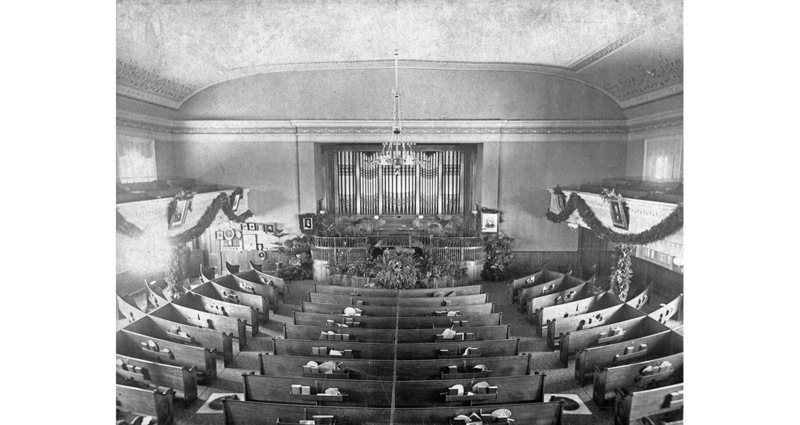 Interior of Winter Street Church in Bath, Maine, taken before the turn of the twentieth century showing decorative painting on ceiling and walls. Courtesy of Sagadahoc Preservation, Inc. Historic New England is excited to announce our annual Community Preservation Grants, with awards of $1,000 in each of the six New England states. We award these grants to small to mid-sized non-profit organizations that align with our mission by preserving and sharing New England heritage. Windham Textile and History Museum in Willimantic to digitize 425 of the museum’s most important oversized textile machinery drawings for online access. Sagadahoc Preservation, Inc., in Bath to help fund historic paint finish documentation for restoration of the Winter Street Church. Fitchburg Historical Society toward a master plan for renovation of the Phoenix Building in a downtown revitalization area. Warner House Association in Portsmouth to support a textile care workshop for small museums held at the New Hampshire Historical Society in Concord. Tomaquag Museum in Exeter for an oral history video project with ninety-five-year-old Chief Strong Horse, an elder of the Narragansett Tribe. Root District Game Club in Norwich toward matching a grant for foundation repair for the 1937 one-room Root Schoolhouse. We invite organizations to apply for a Community Preservation Grant every summer. Let us know if you’d like to be notified when next year’s application is available. See the full list of past Community Preservation Grant winners.